LABION is, since 2008, the Laboratory of Nanomedicine and Clinical Biophotonics of FONDAZIONE DON GNOCCHI (FDG), a 60 years old not-for-profit organization involved in the fields of health, rehabilitation, training and international cooperation. FDG, headquartered in Milano (Italy) holds 29 centres in 9 Italian regions, with more than 4000 beds and about 6000 operators employed. Around 3,5 millions patients access FDG yearly. Scientific research is performed in several centres of Don Gnocchi Foundation and two of them have been recognized by the Ministry of Health as “IRCCS” (research hospital of national interest) in the field of rehabilitation medicine; in particular, the main research lines are advanced technology, biotechnology, neurological, cardiological and pulmonary rehabilitation, disability. Each year, in all of these fields, more than one hundred peer-reviewed papers are published on international journals, and about 150 research projects are planned, declared to Italian Ministry of Health (the government institution monitoring the activity of research hospitals) and executed, leading to translational results applicable at patient’s bed. 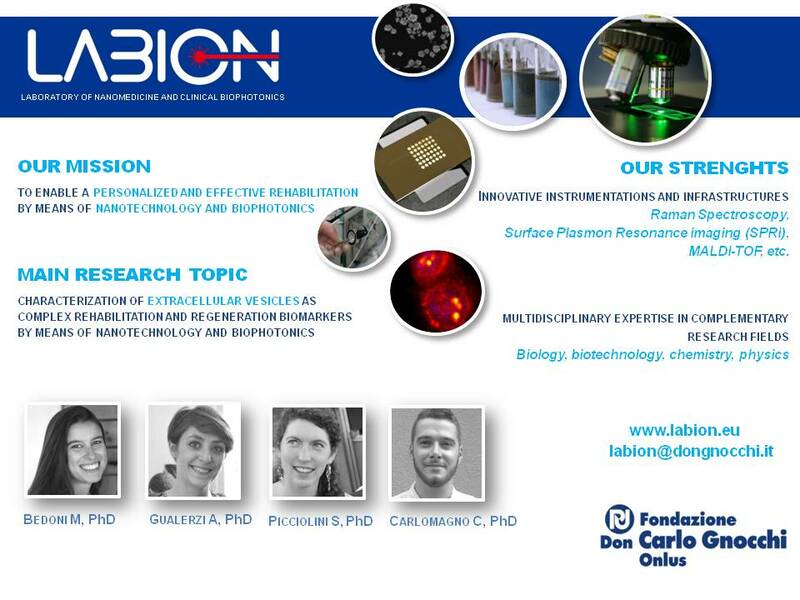 LABION is a part of the biomedical technology department of FDG, that exists from more than 25 years, with deep experience on biosensors, devices for rehabilitation and assistive technologies. More than hundred projects have been run in the department in the field of technology applied to disability and rehabilitation, even at European level (starting from the first framework programmes). The main mission of the LABION is to provide clinical community, engaged with the challenge of a personalized and more effective rehabilitation, with powerful enabling technologies based on nanotechnology (to reach the molecular level) and bio-photonics (that is, using the light to find-out specific molecules as disease markers). Those two combined techniques allow a higher specificity and sensitivity to detect disease biomarkers and monitor the effects of treatments, to fine tune the care in a personalized perspective or to change it to be more effective. The nano-bio-photonics detection techniques can be used as well in the three crucial phases of personalized medicine: the precise and early diagnosis, the accurate monitoring of the response to regenerative rehabilitation therapies and the evaluation of the level of the minimal residual disease (related to very small quantities of disease biomarkers still present after the treatment, often undetectable by traditional methods). LABION has been granted by Ministry of Health, Lombardy Region and by several other national (like Cariplo Foundation) and international institutions by funding projects aimed at chronic patients treatment and monitoring the rehabilitation phase. LABION is characterized by a high interdisciplinary environment, both in terms of equipment and of people background (physics, biology, bioengineering, pharmaceutical chemistry, biotechnology), allowing the researchers to look at a single phenomenon or process from very different points of views at the same time, and to discuss how to approach it “as a whole”. A solid international network with excellent academic, research and clinical institutions as well as with high-tech companies completes the LABION positioning in a very favorable perspective.